Call the Library to sign up and read to Eli. He will be here 9:30 - 11:30 and is looking forward to seeing you. Ages 12-24 months with a caregiver. A fun-filled half hour featuring books, finger plays, and lots of music and movement. No registration required. This month's book is Bel Canto by Ann Patchett. View our entire reading list here! Ages 2 ½ - 3 with a caregiver. Join us for books, songs, puppets, finger plays, a film, and fun! Please register using the March 19th date. Ages birth to 3, with a caregiver. Learn some rhymes, read a book, dance, sing, and socialize with toys. No registration required. Age 3, for the child alone. Children enjoy books, songs, a craft and a film. Please register. Age: 2 with a caregiver. Enjoy books, music, puppets, fingerplays and an occasional craft. Please register on the March 20th date. Need help troubleshooting your new phone, tablet or laptop? Would you like to learn more about basic computing (i.e. setting up an email account, or uploading photos to the cloud)? 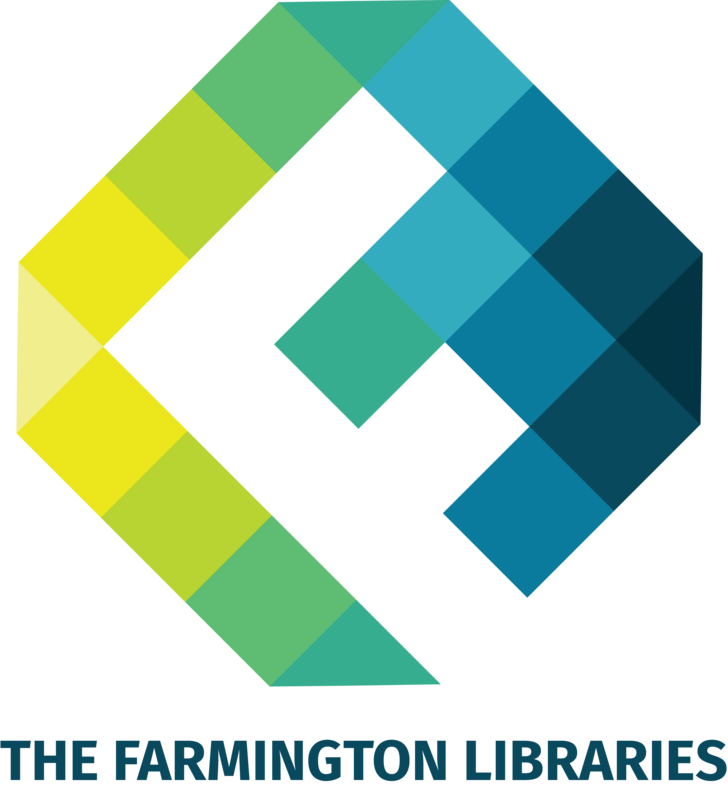 Meet one-on-one with our Teen Tech Mentors at the Farmington Library to learn these skills and more! Please register to reserve your 30 minute session. Learn to Knit with Miss Paula. Wednesdays at 5:30 pm. Please register. This class is for children ages 7 and up. We will provide yarn and needles to get you started. You will learn the basic knit stitch and we will work on a group project together. Music and movement for children ages birth to 3 and their caregivers. Tots & Tunes is offered 3 times a week. Come as often as you like! Make your own unique cards with watercolor paints by painting over a doily. Express yourself with your color choices. Make several cards. Supplies will be provided. AGES 12+ (ADULTS TOO!). Registration is required. Space is limited. Registration will open a month before each class in this series. Celebrate the season! Come for a special story time and craft. Sing and dance, be prepared to get messy! Ages 2-4 Please register. Art class for children ages 2-4 and their caregivers. Each week we will share a book and explore a different art medium to learn about colors, shapes and textures. Please bring a smock or old shirt to protect your child’s clothing. Please register for the series on the March 21 date. For babies ages birth through 12 months, accompanied by parent or caregiver. Join us for the next four weeks for a time of play, stories, and talk for you and your new baby. Register for a reminder or just drop in. at 860-673-6791 to schedule an appointment. Under three accompanied by an adult. Age 2 with a caregiver. Enjoy books, music, parachutte, puppets and film. Please only register for either Monday or Wednesday. Please register. Please register for this series on the March 18 date. Ages birth-5 with a caregiver. Speak to your child in the language you know best! Join Miss Eva forstorytime in Polish. Enjoy stories and activities, and browse our Polish-language collections. Please register for each storytime. Play old favorites with new friends, and learn some great new games from an expert! Games include Gloom, Munchkin, Settlers of Catan, Scrabble, Elder Sign, Hogwarts Battle and more! Pleae feel free to bring any games you would like to share with the group. Snacks will be provided. Open to adults and teens ages 12 & up. Come dance around the May Pole (ioutside weather permitting), This program will be held in the Community room in the event of rain. Bring fresh flowers and dress in your festive clothes. This program will be held in place of 10:30 Tots & Tunes. All are welcome. No registration required. This infant message class presented by The Parent and Child Center of Bristol Hospital will help make your baby happier, calmer, and more easily soothed. Parents will learn and practice hands-on message techniques with their infant child. Also breathing and relaxation techniques for your toddlers will be introduced. Please bring a blanket. Best suited for ages birth-three. School is out early so come to the library and make your own perler bead creation! We will iron it for you and add a clip so you can hang it on your backpack. Follow a pattern or make up your own. Ages 7 and up. Please register. School is out early today so come to the Library! We will watch the movie " Saige Paints the Sky" and paint on a mini canvas, just the right size for your doll or friend to hang in her space. All ages welcome to watch the movie. Please register to participate in the craft. It Happens Every Spring (1949) Comedy - Classic baseball farce starring Ray Milland as a college chemistry professor in search of enough money to enable him to propose to sweetheart Jean Peters. He invents a solution that repels wood and uses it to become a pitching phenomenon, striking out scores of batters with his unhittable "screwball." Paul Douglas, Ed Begley, Alan Hale, Jr. co-star. 86 min. Music and movement for children ages birth to 3, with caregivers. Tots and Tunes is offered three times a week – come as often as you like! No registration required. Celebrate the season! Come for a special story time and craft. Sing and dance, be prepared to get messy! Lonely are the brave (1962) Western - Classic "new style" western stars Kirk Douglas as a noble cowboy who finds himself struggling to adjust to the times as the Old West fades away. After learning that one of his friends is in jail, he gets himself locked up in order to be closer to his pal. But when his buddy doesn't want to join him on the road, Douglas busts out and becomes a fugitive dogged by a disenchanted sheriff. With Gena Rowlands, Walter Matthau, Michael Kane, and Carroll O'Connor. 107 min. Julia Misbehaves (1948) Comedy - Witty and sophisticated comedy stars Greer Garson as penniless showgirl Julia Packett, who finds adventure and romance while on a boat ride to France, where her daughter (Elizabeth Taylor) is scheduled to get married. Upon arriving in Paris, Julia reunites with her ex-husband (Walter Pidgeon), leading to a series of humorous complications. With Peter Lawford, Cesar Romero, and Reginald Owen. 99 min. An act of murder (1948) Drama/Suspense - Stern small-town judge Calvin Cooke (Fredric March) always demanded strict adherence to the letter of the law--of himself as he did others. However, when forced to grapple with the terminal illness and suffering of his beloved wife (Florence Eldridge), he does the unthinkable to end her pain--and the skilled young defense lawyer (Edmond O’Brien) Cooke often clashed with faces his greatest challenge. Provocative courtroom drama co-stars Geraldine Brooks, Stanley Ridges, John McIntire. 92 min. Solid Gold Cadillac (1956) Comedy - Judy Holliday turns in a tour-de-force performance in this memorable comedy with satirical barbs hurled at big business and government. She's a minority shareholder in a huge corporation who takes the crooked board of directors to task over some of its doings and enlists former honcho Paul Douglas to help set things right. Fred Clark, John Williams co-star; George Burns narrates. 100 min. Ransom (1955) Drama - A wealthy executive (Glenn Ford) gets the chilling news that his young son was abducted from his school. As harrowing as the ordeal proves for him and his wife (Donna Reed), the couple's breaking point may come when he publicly flips the kidnappers' $500,000 demand into a bounty on their heads. Intense crime drama co-stars Leslie Nielsen (his film debut), Robert Keith, Alexander Scourby, Juanita Moore. 109 min. Full of Life (1956) Comedy - Judy Holliday plays the pregnant wife of struggling writer Richard Conte who comes under duress when hubby's opinionated father tries to ensure that the couple finally gets a proper, full-blown church wedding. Family farce features Esther Minciotti, Joe De Santis, and Metropolitan Opera star Salvatore Baccaloni as Papa; scripted by John Fante from his novel. 91 min. Reunion in France (1942) War - Glossy romantic drama set against the turbulence of WWII France stars Joan Crawford as a French businesswoman who tries to help downed American RAF pilot John Wayne escape from the Nazis. Believing that her fiancé is a Nazi collaborator, she attempts to keep the Yankee flyer hidden until she can figure out how he can flee the country. With Philip Dorn, John Carradine; look for an uncredited Ava Gardner. AKA: "Mademoiselle France." 104 min. Born Yesterday (1950) Comedy - Judy Holliday won an Academy Award for repeating her Broadway role as Billie Dawn, the streetwise but uncultured girl of a gruff junk magnate (Broderick Crawford), who hires a newsman (William Holden) to give her some "class." George Cukor directed this "Pygmalion"-like comedy from playwright Garson Kanin. 102 min. Night of the Hunter (1955) Drama - Harrowing suspense classic of two children on the run from their psychotic religious fanatic stepfather, who murdered their mother in a search for money stolen from a bank by their father. Robert Mitchum is the spellbinding "preacher" with "LOVE" and "HATE" tattooed on his knuckles; also stars Lillian Gish, Shelley Winters, Peter Graves. Charles Laughton's only directorial effort. 93 min. Without Reservations (1946) Comedy - High-spirited romantic farce starring Claudette Colbert as a famous authoress who finds the perfect person to play the lead in her book when she meets Marine flier John Wayne on a train. Love blooms amid funny complications in this delightful take on "It Happened One Night" featuring Don DeFore, Anne Triola and cameos from Jack Benny and Cary Grant. AKA: "Thanks God, I'll Take It from Here," "California Express." 101 min. Apartment for Peggy (1948) Drama - While trying to make a home life for returned soldier husband William Holden as he pursues his G.I. Bill college degree, ebullient housewife Jeanne Crain also manages to show their landlord?elderly, depressed professor Edmund Gwenn?that life always has much to offer. Affecting slice of postwar Americana co-stars Gene Lockhart, Betty Lynn; George Seaton writes and directs. 96 min. Desk Desk (1957) Comedy - Katharine Hepburn and Spencer Tracy star in this spry comedy based on the play by William Marchant. Bunny Watson (Hepburn) is the head of a TV network's research department who fears her job is in jeopardy due to the arrival of efficiency expert Richard Sumner (Tracy) and his "electric brain" computer EMERAC. Are the sparks flying around the office from EMERAC, or are they being generated by the romantic tension between Richard and Bunny? With Gig Young, Joan Blondell. 103 min.